I have recently been making the rounds on the South Shore of Massachusetts, photographing Civil War monuments in 14 different towns. The story of the efforts to raise these monuments and the remarks made during the dedication ceremonies shed light on some interesting elements of social and political history in the post-Civil War era–particularly the leadership roles women played in organizing the efforts and some of the views expressed by speakers on the politics of Reconstruction. In a broad survey such as this, I can only briefly touch on such matters but they are worthy of further exploration, perhaps in future articles. Additional information and photos can be found at the Massachusetts Civil War Monuments Project. I will present the monuments in two parts, and in chronological order. Halifax: Located on a town lot across from the Halifax Congregational Church, 503 Plymouth Street. Dedicated on July 4, 1867, the monument bears the names of 24 men lost in the war. The primary inscription reads, “Our Patriot Soldiers.” A simple obelisk in form, it was constructed at a cost of $1,200. Although not the first in the Commonwealth, the Halifax monument was the first built in Plymouth County and among the earliest in the state. Fundraising was coordinated by the local Ladies Aid Association, with the Town of Halifax making a final appropriation to meet the necessary cost. Mrs. Aroline Soule, who had been active with the Unitarian Church and soldier’s relief efforts during the war, was the moving spirit behind the fundraising. She had lost a son to the war, Charles W. Soule, who died in Newbern, North Carolina in 1862. She wanted a fitting monument to honor his memory and others from the town who had been lost. The key speaker during the dedication was the Hon. Thomas Russell (1826-1887), judge of the Superior Court of Boston and Collector of the Port of Boston. He had been a radical abolitionist and a supporter of John Brown. Judge Russell was the key speaker for at least one other South Shore monument dedication and spoke at ceremonies in other parts of the state. We might therefore surmise he was an impressive orator and a man who felt some duty to honor those fallen in the war. Hingham: Located in the center of Hingham Cemetery, 40 Water Street. Dedicated on June 17, 1870, the monument bears the names of 74 men lost in the war. The primary inscription reads, “Honor to the Brave.” It was built at a cost of $6,650. Rising 30 feet in height, the monument is an obelisk built of Quincy Granite. Mr. F.J. Fuller of Quincy was the architect and builder. The fundraising efforts were organized by a town Committee on the Soldiers and Sailors Monument. 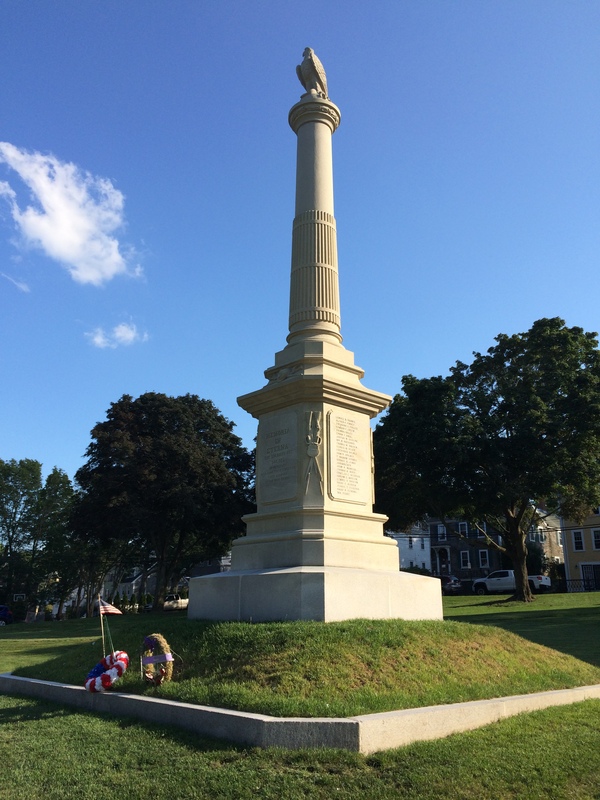 In addition to building the monument and coordinating the celebration, this committee also published a lengthy history on their work and Hingham’s involvement in the Civil War. 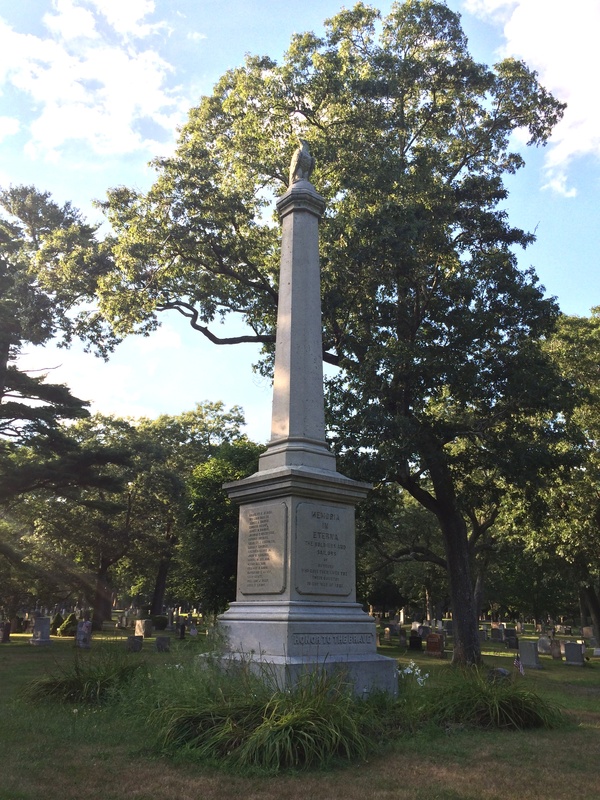 Initially, the town considered placing tablets in the Town Hall, this was quickly tabled in favor of building a monument on a prominent hill in the center of the Hingham Cemetery overlooking the town’s harbor. The procession during the dedication took the form of a parade through town, “which in length, character and brilliancy,” observed committee chairman John Cushing, “was probably never surpassed in this Town upon any occasion.” The procession paused to gather in Agricultural Hall, now the site of the Hingham Library, where the key speaker, Hon. Solomon Lincoln (1804-1881), gave an address. He was part of that large and respected family descended from Samuel Lincoln, who first settled in Hingham in 1637 and from whom President Abraham Lincoln was descended as well. Solomon Lincoln was a lawyer, local historian, and former state representative. 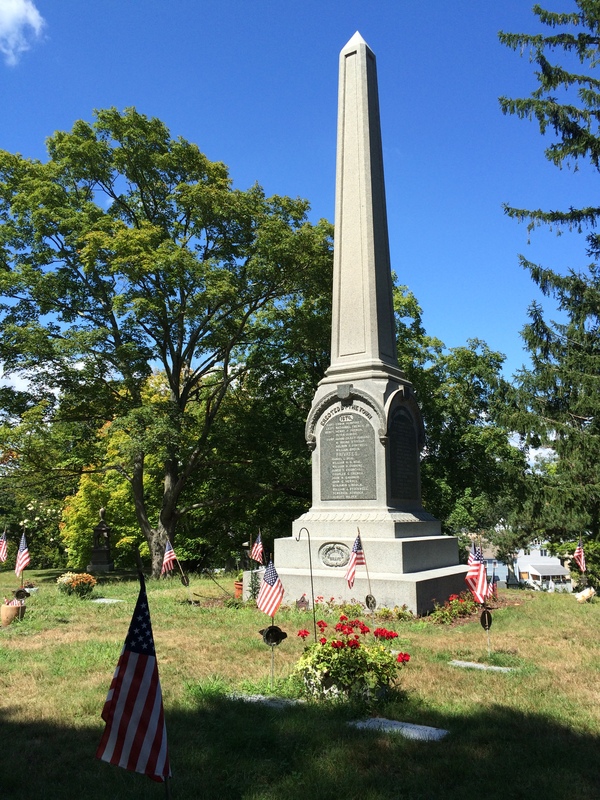 Hingham Cemetery is also the resting place of War Governor John Albion Andrew. A handsome marble statue was placed over his grave, very near the Civil War monument, in 1875. Duxbury: Located in Mayflower Cemetery, 774 Tremont Street. Dedicated on Memorial Day, May 30, 1872, the monument bears the names of 37 men lost in the war. 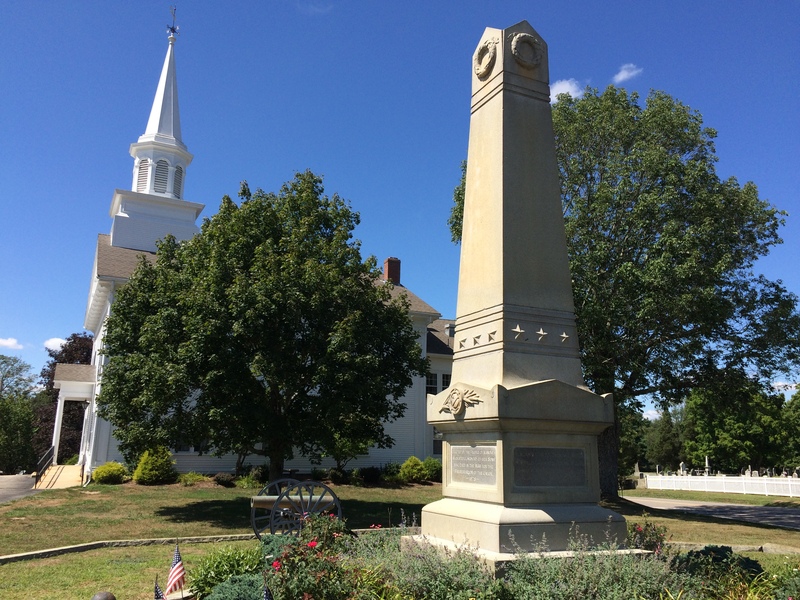 The primary inscription reads, “Memoria in Eterna, The Soldiers and Sailors of Duxbury who Gave their Lives for their Country in the War of 1861.” It was built at a cost of $2,500. A victory column crowned by an eagle, in form and design it is quite similar to the Plymouth monument, although a smaller version thereof. The two likely were designed by the same architect, although the name of this architect has proven elusive. The fundraising was coordinated by the Ladies Association, referred to by the GAR post adjutant as “The Willing Workers.” The president of this association was Deborah Brownell Weston, widow of the Hon. Gershom B. Weston of Duxbury who had been a leader of recruitment and a dedicated supporter of Duxbury soldiers. During the war, Deborah B. Weston had been an Associate Manager of the New England Women’s Auxiliary Association, supporting the efforts of the United States Sanitary Commission. Her organization raised the full amount for the monument through public subscription. During the dedication ceremonies, Capt. Henry B. Maglathlin of the 4th Massachusetts Infantry gave the introductory remarks. The key speaker was Judge Thomas Russell of Boston, the same who had spoken five years earlier in Halifax. A prayer was offered by Rev. Frederick N. Knapp of Plymouth who had played a remarkable role during the war as head of the Special Relief Department of the U.S. Sanitary Commission. For additional information and photos see the Duxbury page at the Massachusetts Civil War Monuments Project. Norwell: Located on the Norwell Common, across from 6 West Street. Dedicated on July 3, 1878, the monument bears the names of 24 men lost in the war. The primary inscription reads, “Liberty and Union, Established by our Fathers, Preserved Unimpaired by the Patriotism of their Sons.” It was built at a cost of $3,500. Of this, $1,000 was appropriated by the town and $2,500 raised by the GAR Post and Soldier’s Aid Society. The town was, at the time, known as South Scituate and would not be renamed Norwell until 1888. The monument therefore still bears an inscription to the sons of “South Scituate.” Fundraising for the monument came in the wake of the Panic of 1873 which resulted in a 6-year economic depression. The effort therefore took several years. 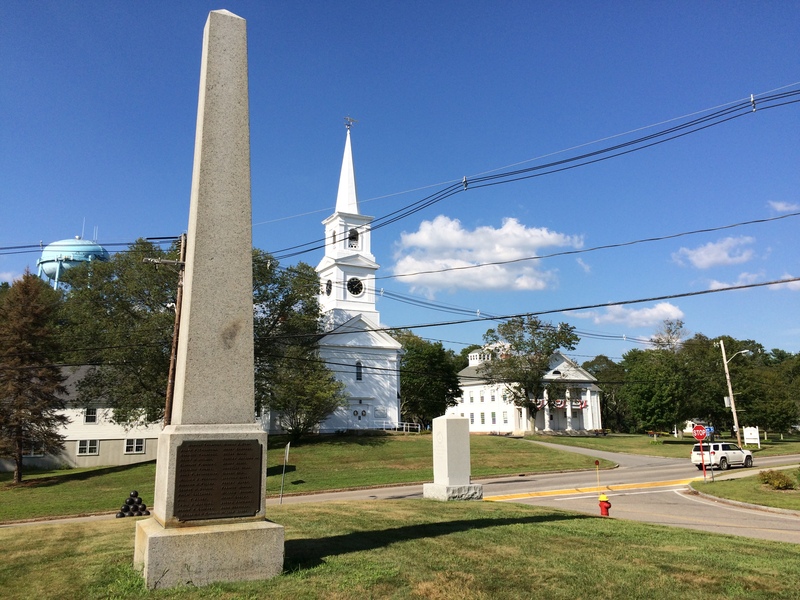 The organizing committee managed to defray the costs somewhat by accepting a column that had already been built for a New Hampshire town but for whatever reason was not used. General Horace Binney Sargent (1821-1908), a veteran who had been seriously wounded during the Red River Campaign in Louisana in 1864, was the principal speaker during the exercises. At the time, he was Commander of the Massachusetts Department of the GAR. The day was blazing hot, so exercises were moved out of the sun to the First Parish Church. Unfortunately, this caused some delay which resulted in General Sargent being unable to finish his address as he and other guests had to rush to catch the train back to Boston. Additional photos and names of those lost in the war here. Hanover: Located next to the First Congregational Church of Hanover, 547, Hanover Street. Dedicated on July 17, 1878, the monument bears the names of 23 men lost in the war (for additional photos including their names see the Massachusetts Civil War Monuments Project). 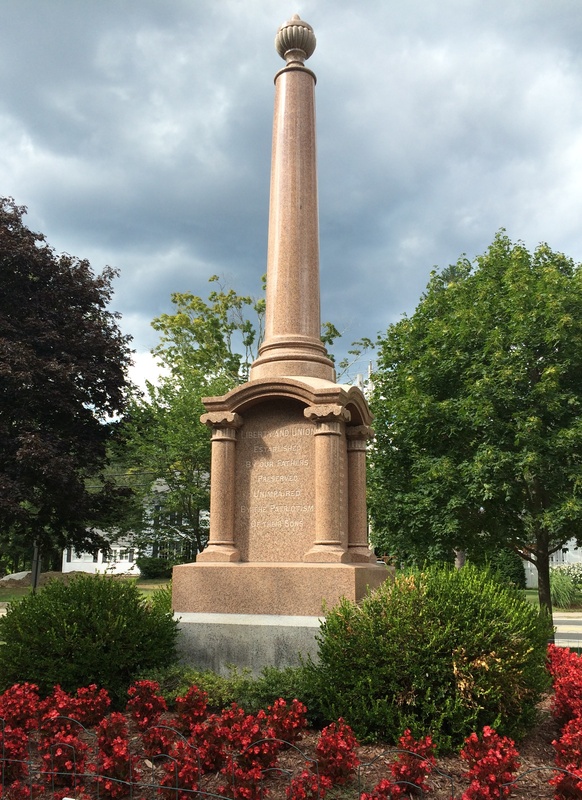 The primary inscription reads, “Erected by the People of Hanover in Grateful Memory of her Sons who Died in the War for the Preservation of the Union, 1878.” It was built at a cost of $1,700, half through fairs and public subscription and half through a town appropriation. The monument committee published a history of the effort and a full transcription of the lengthy exercises on the day of dedication. In this account, it is noted that the monument was first proposed by a speaker during the town’s Memorial Day exercises in 1877 who observed that too much time had elapsed since the end of the war without any memorial. The unnamed speaker, “suggested that the ladies–always first in every good work–should take the matter in hand, and by means of a Fair should endeavor to aid in procuring such an amount of money as would suffice.” The efforts of “the ladies” were swift and successful and the necessary funds were raised in less than a year. Made of Concord, New Hampshire granite, the monument was designed by local architect John Williams Beal. He was a novice at the time but would go on to design many elaborate mansions throughout New England. The dinner following unveiling had a staggeringly long roster of speakers and must have lasted many hours. General Nathaniel P. Banks was among them. No doubt, the president of the day had an uncomfortable time re-taking the rostrum and attempting to re-direct the mood of the ceremony after that speech. The first six of these South Shore Civil War monuments, it will be noted, are obelisks or victory columns, lacking any statues of soldiers. That phenomenon begins in the 1880s and will be explored in the second part of this survey.